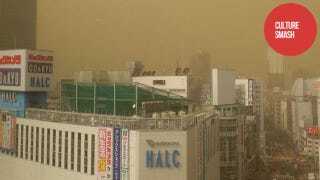 This weekend, sand storms blew through Japan. Cities like Tokyo were covered in an unreal yellow haze. Every year, yellow sand from the deserts of Mongolia and northern China blow over North and South Korea as well as Japan. The sand is called "kousa" (黄砂) in Japanese and "Asian Dust" in English. The winds also bring pollution, pesticides, and even viruses and bacteria. Many Japanese snapped up air purifiers and donned masks to protect themselves. Artistic minded individuals did what they do best: drew anime characters of the storm. This year, the storms were particularly bad. Oddly, the Japan Meteorological Agency denies that this was Asian Dust sweeping through Tokyo. Instead, it says this was simply "haze" (煙霧 or "enmu"). Some in Japan are assuming that the Japanese government is trying not to point fingers at China, especially in light of recent tensions between the two countries. And as The Japan Times noted, there's increased concern that even more of China's rising pollution would be scattered across Japan. Here are collected photos via 2ch and Twitter of the sands as they make their way through Tokyo and the rest of Japan. Looks rather yellow for just haze! The storms have passed through much of Tokyo, taking the yellow dust with them, leaving clear skies and probably a whole bunch of other stuff. Here are some personifications of the dust. One Twitter user even noted that if you wield a pellet gun in the yellow haze, it kind of looks like a first-person shooter. It kind of does, because FPS games are always so brown. Not sure if they're so polluted, though.